Maurice Sendak: Maurice Sendak was an author and illustrator of children’s books. Maurice Sendak was an American author and illustrator of children’s books. He is mainly known for his book, “Where the Wild Things Are,” among various other children’s books he wrote, as well as for other children’s books he illustrated. He is also known for designing sets for various famous ballets and operas. What is Maurice Sendak famous for? What are some of Maurice Sendak’s other works? Maurice Sendak’s first professional commission was to create window displays for F.A.O. Schwarz, a popular toy store. F.A.O. Schwarz is currently the oldest toy store in the United States. The FAO Schwarz flagship store is located on Fifth Avenue in New York City, which is a popular tourist destination. Many people will recognize its iconic floor piano and real-life toy soldiers. FAO Schwarz is now owned by Toys "R" Us Inc.
Sendak’s first publication was in 1947, when his illustrations where published in a textbook titled Atomics for the Millions by Dr. Maxwell Leigh Eidinoff. 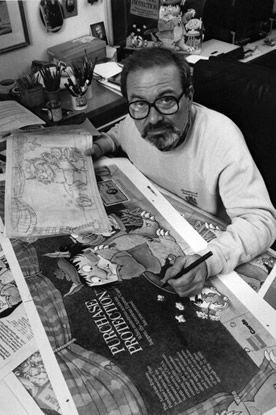 The next decade, Sendak spent illustrating various children’s books, including two which were written by his older brother, Jack Sendak. Maurice Sendak got well known after illustrating Else Holmelund Minarik's Little Bear series of books. However, he got international recognition after writing and illustrating, “Where the Wild Things Are,” which was first published by Harper & Row in 1963. Was an early member of the National Board of Advisors of the Children's Television Workshop during the development stages of the Sesame Street television series. Created the children's television program Seven Little Monsters. His final book, “Bumble-Ardy”, was published eight months before his death. Where was Maurice Sendak born? 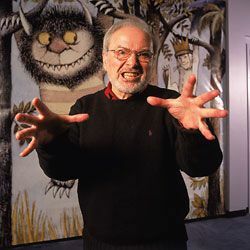 Maurice Sendak was born in Brooklyn, New York on June 10, 1928. His parents were Jewish and had emigrated from Poland. His dad was Philip Sendak, a dressmaker and Sadie Schindler. His childhood was affected by the deaths of many family members during the Holocaust. This exposed him to death and mortality. After a successful life as a children’s author and illustrator, Sendak died on the morning of May 8, 2012, at Danbury Hospital in Danbury, Connecticut, at the age of 83, from complications of a stroke. What was Maurice Sendak’s inspiration for becoming an author and illustrator? Maurice Sendak fell in love with books when as a child, he developed health problems and had been confined to his bed with only books to keep him company. At the age of twelve, he watched Walt Disney's film Fantasia. After this, he decided that he was going to become an illustrator. What are some of the awards and honors that Maurice Sendak received? Sendak was honored in North Hollywood, California, where an elementary school was named after him. Also, the 2012 season of Pacific Northwest Ballet's "The Nutcracker," for which Sendak designed the set, was dedicated to his memory. On June 10, 2013 Google featured an interactive doodle which showed an animated movie-ette of Sendak’s most popular characters. In a New York Times’ article, Sendak announced that he was gay and lived his partner, psychoanalyst Dr. Eugene Glynn, for 50 years before Glynn's death in May 2007. His parents never knew. After Glynn's death, Sendak donated $1 million to the Jewish Board of Family and Children's Services in memory of his partner who had treated young people there. They will name a clinic after Dr. Eugene Glynn. Sendak was an atheist. He was once quoted as saying that religion, and belief in God "must have made life much easier [for some religious friends of his]. It's harder for us non-believers." His book “In the Night Kitchen,” contains some drawings of a young boy prancing naked through the story. Due to this, the book has been challenged in several American states including Illinois, New Jersey, Minnesota, and Texas. It listed number 21 on the "100 Most Frequently Challenged Books of 1990–1999," and commonly appears on the American Library Association's list of "frequently challenged and banned books". Maurice Sendak illustrated nearly a hundred picture books throughout a career that spanned more than 60 years. Sendak grew up idolizing the storytelling abilities of his father, Philip, and his big brother, Jack. His father often told him tales from the Old Testament, embellished with racy details. Maurice was often sent home after retelling his father's version of the Bible tales at school. As a child he illustrated his ﬁrst stories on shirt cardboard provided by his tailor-father. Aside from a few night classes in art after graduating high school, Sendak was a largely self-taught artist. His characters, stories, and inspirations were drawn from among his own neighbors, family, pop culture, historical sources, literary inﬂuences, and long-held childhood memories. He also drew inspiration and influences from a vast number of painters, musicians and authors. He has been quoted as saying, "My gods are Herman Melville, Emily Dickinson, Mozart. I believe in them with all my heart." He worked with such well-known children’s authors as Ruth Krauss, Else Minarik, and Arthur Yorinks, and illustrated books by Leo Tolstoy, Herman Melville, Isaac Bashevis Singer, the Brothers Grimm, and the poet Randall Jarrell. In the 1970’s, Sendak also worked as a costume and stage designer, designing operas by Mozart, Prokoﬁev, Ravel, and Tchaikovsky, among others. He won numerous awards, including a Caldecott Award, a Newberry Medal, the international Hans Christian Andersen Award, a National Book Award, the Astrid Lindgren Memorial Award, and a National Medal of Arts. His books have translated into dozens of languages. The New York Times obituary called Sendak "the most important children's book artist of the 20th century."